White River Knives has collaborated with Justin Gingrich of GTI to produce this series of tactical / survival knives. Justin was a U.S. Army Ranger who served 10 years active duty. He is now a bladesmith and provides instruction in patrolling, demolitions, shooting and CQB techniques through Gingrich Tactical Innovations. This line of White River / GTI knives is designed by Justin to help you prevail in any situation. All blades are CPM S35VN. The smallest GTI 2.5 ($100) has a 2.5-inch blade and an integral bottle opener and Kydex sheath. 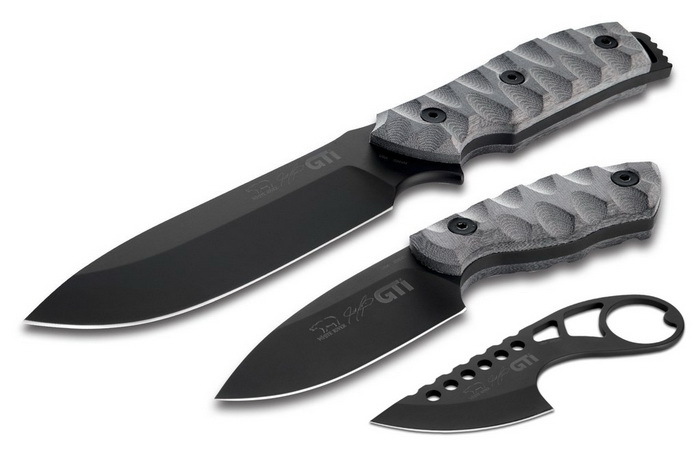 The is the medium size GTI 3 ($160) has a 3-inch blade. The large GTI 4.5 ($260) has a 4.5-inch blade. The two largest come complete with ionbond coating, micarta handle scales, and a USA made MOLLE compatible leather sheath.